5 more ways to avoid buying the wrong house – "I KNOW TORONTO!" Last week I wrote about six important things that will ensure you buy the right house at the right price, using your head, rather than your heart. Here are five more things to keep in mind. 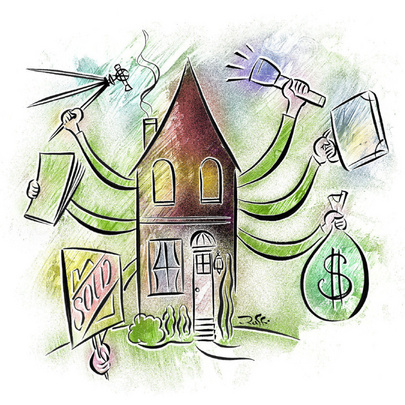 The main reason you overpay is panic while you are caught up in a bidding war. In advance, find out first what the house should sell for. Many sellers deliberately list for a price below market to attract a lot of buyers. Do not tip your hand. If you give your offer too early in the day, the seller’s agent will call everyone to try and encourage a bidding war. Bring in your offer around 7 pm and make the irrevocable period no more than four hours. Put the pressure on the seller, not on yourself. Ask the seller or the sellers agent if they know about an problems with the house, things like basement flooding, mould or roof leaks, even if the leaks have been repaired. Then ask if they know about the neighbourhood that would have an impact on your purchase. Tell them you are relying on this information. Watch how they answer. Most sellers will refuse to sign property disclosure statements, but they are required to respond truthfully to these questions if you ask them directly. If the seller refuses to answer or acts suspiciously, then you need to discuss this with your home inspector and your real estate agent and either adjust your purchase offer or walk away. NextOctober 2011 Newsletter: Two Great Listings and the Toronto Chocolate Festival!